Currys and PC World will be selling the Samsung Galaxy Tab 10.1 Android tablet a day before anyone else, launching the slate at the Tottenham Court Road branch on 3 August. Londoners who simply cannot wait the extra sixteen hours to get their hands on the slim iPad 2 contender, should head down to the flagship store at 5pm on 3 August, when the tablet will go on sale for the first time in the UK. Other Currys and PC World stores, as well as non DGI-group owned retailers, will be selling the Samsung Galaxy Tab 10.1 on its official UK release date of 4 August. It's been a bit of a wait for the Samsung Galaxy Tab follow-up, given that Samsung decided to hold it back and slim it down after the release of the slinky iPad 2. Vodafone originally had the exclusive on the chunkier slate, dubbed the Samsung Galaxy Tab 10.1V, but that's now been axed and the Weight Watchers' edition will go on general release when it launches. The Honeycomb-running tablet comes with a front-facing camera, a 1GHz dual-core Nvidia Tegra 2 processor and full Flash capability; we branded it the best Android tablet yet in our 4.5 star review. With the Samsung Galaxy Tab 10.1 UK price starting at just £399 (the same price as the lowest-spec iPad 2), it's expected to make tablet waves when it lands in August. 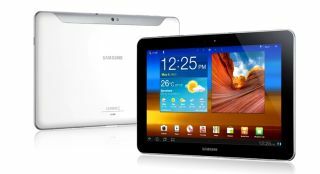 Is the Samsung Galaxy Tab 10.1 right for you, though? Check our tablet buyer's guide below for handy hints on choosing a tablet.